Persona 4 has plenty of appeal to a wide variety of gamers. What's more is that the property has also taken hold in the anime world as well and now UDON Entertainment is looking to get the property in on some manga action. Persona 4 Vol.1 and Persona 4 Vol. 2 are now available for readers. 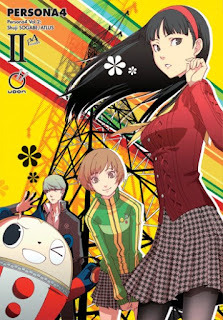 And June 28th will see the release of Persona 4 Vol. 3. When the small rural town of Inaba suddenly becomes the scene of a series of grisly murders, an eclectic group of high school students forms an investigation team to uncover the truth behind them and prevent more deaths. But when they discover that the murders might be connected to an urban legend about a paranormal television phenomenon called the “Midnight Channel,” a simple investigation turns into a dangerous, action-packed journey of self-discovery across two different worlds. Toronto, ON – MAR 11, 2016 – The critically acclaimed, best-selling Persona 4video game has already taken the gaming and anime worlds by storm. Now, UDON Entertainment is excited to spread Persona fever among manga fans as well with the release of Persona 4 Vol. 1 and Vol. 2, available now at various physical and online retailers! If you can’t wait to see what happens next after reading the first two thrilling volumes, no need to worry! Persona 4 Vol. 3 is already scheduled for release later this year, on June 28th, 2016. Meanwhile, the first two volumes of Persona 4 are available now in finer comic book stores and book retailers everywhere, as well as various online retailers. Media inquiries and/or requests for review copies should be directed to Jenny Myung at press@udonentertainment.com. UDON Entertainment is a publisher of original and translated art books, graphic novels, and manga. UDON boasts an incredible lineup of highly sought-after products with production quality and English localization work that is second to none. Our best-known projects are those based on popular video game franchises, including Street Fighter, Okami, Mega Man, Dark Souls, Persona, Bayonetta, Valkyria Chronicles, Sonic the Hedgehog, and many more. UDON also publishes books based on top anime properties including Neon Genesis Evangelion, Gurren Lagann, and Haruhi Suzumiya as well as completely original projects like RandomVeus, Makeshift Miracle, and Substrata.